Alexander Calder’s sculpture Trois disques is composed of five arches made of unpolished stainless steel. The overlapping arches stand on six slender posts whose tops are adorned with two points and three disks. With its abstract form, the arachnoid structure – asymmetrical but balanced – creates plays of shadow and light that evoke dance movements. The sculpture symbolizes human progress and power. 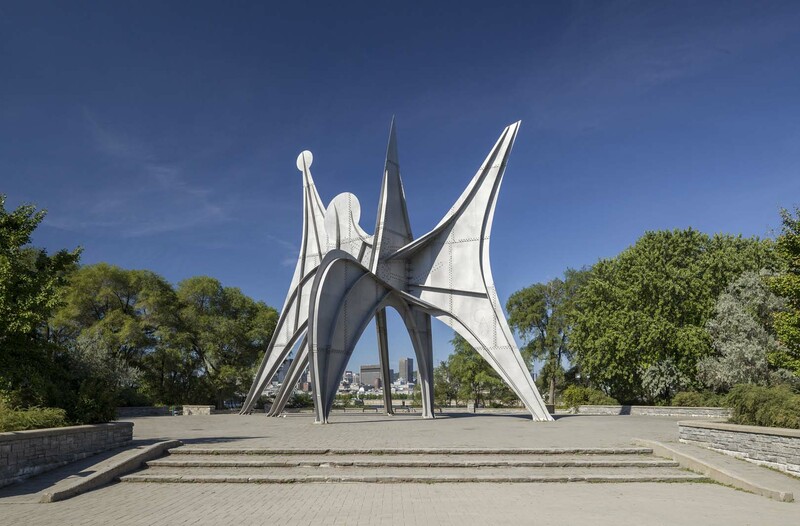 Its site – it was moved in 1991 to the belvedere in Parc Jean-Drapeau on Île Sainte-Hélène build to receive it, 300 metres from its original site – allows the public to circulate around the work and view it from different angles, from near and far. Over the years, it has become an important landmark in the Montréal landscape. Although a number of cities have purchased a Calder stabile, the one in Montréal is unique. At a height of 22 metres, it is the second-largest stabile (after the one in Mexico City, which is 24 metres in height). At the request of the International Nickel Company of Canada, it is not painted, which also makes it the only example of an unpainted stabile. Therefore, Trois disques shows off the raw material, the elements of assembly, and the traces of its fabrication in a frankly industrial aesthetic. In short, human labour and genius are illustrated in Calder’s imposing sculpture. 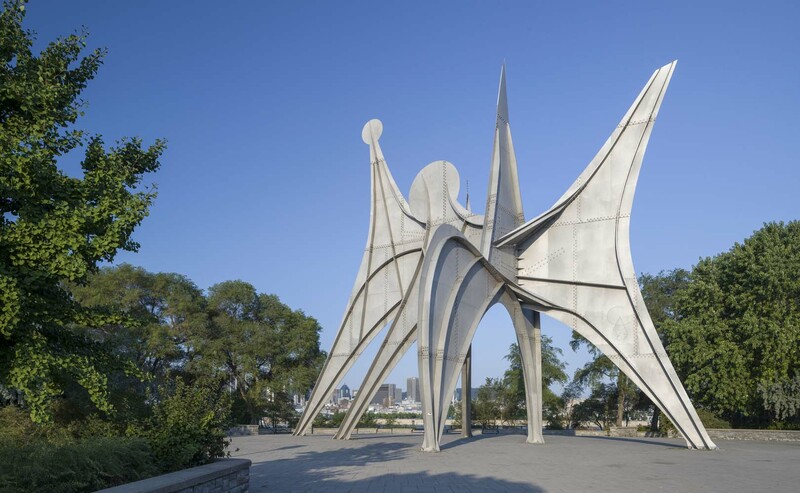 Commissioned from Alexander Calder by the International Nickel Company of Canada for the eponymous square at the Montréal World Fair held in 1967, the artwork was officially presented to Montréalers when the fair ended. 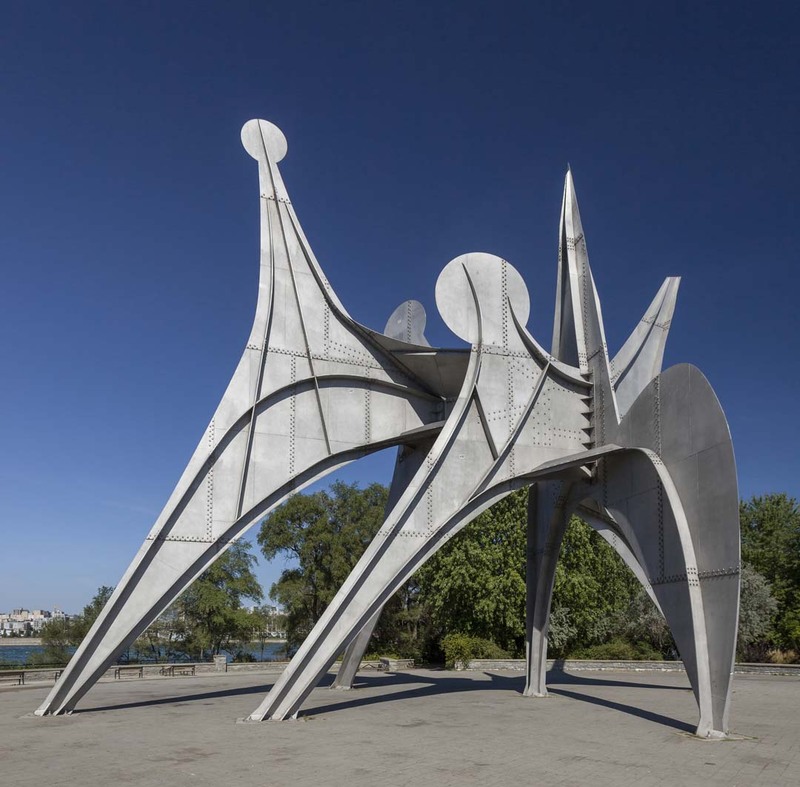 Inspired by the “Man and His World” theme of Expo 67, its title and monumentality made it one of the distinctive symbols of the event. Alexander Calder, born in 1898 in Lawnton, Pennsylvania, came from a family of artists: his father, Alexander Stirling Calder, and his grandfather, Alexander Milne Calder, were sculptors, and his mother, Nanette Lederer Calder, was a painter. He trained as an artist (Art Students League of New York, 1923–25) and engineer (Stevens Institute of Technology, Hoboken, New Jersey, 1915–19). Considered one of the foremost sculptors of the twentieth century, a “merry engineer, troublesome architect, and sculptor of the times,” according to Jacques Prévert, Calder left his mark in the public space with his “mobiles” and “stabiles.” The latter word, invented by Jean Arp, defines Calder’s monumental artworks composed of simple shapes anchored to the ground, which are found, among other places, in Berlin, Chicago, Jerusalem, Paris, Mexico City, and Seattle. Alexander Calder died in New York in 1976.